WOW what a wonderful weekend! 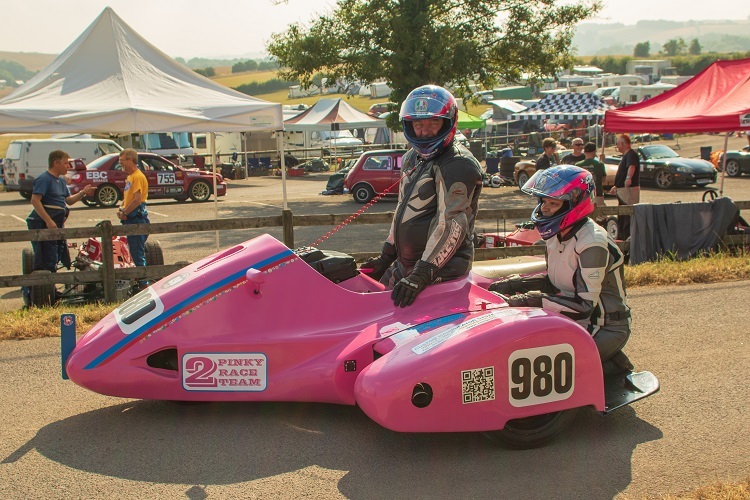 We really couldn’t have asked for better weather over the weekend for the two days of action from the Autocycle Union’s (ACU) Motorbikes and Combinations. We also had two two twelve run-offs too! Saturday and Sunday saw the riders and their machines produce a fabulous display of skill and spectacular racing. There were many changes and additions to the original entry too! 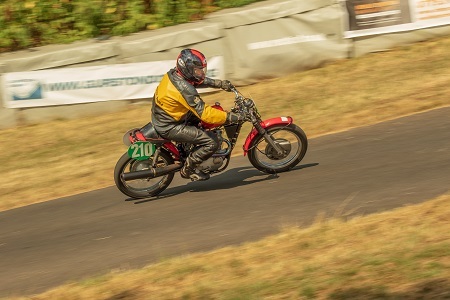 Paul Winch on his BSA had the class to himself and finished on 46.78s. 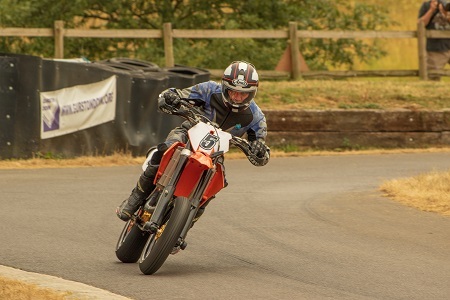 Mike Tilley on his Honda CR went head to head with Isaac Warren on his KTM. Mark made his Gurston experience and previous form pay, he took the class with a 35.99s run. What a great class this was! The top three all had extensive Gurston experience. 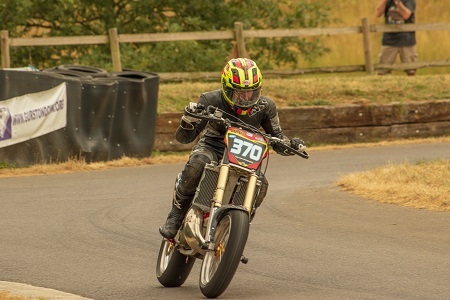 It was Chris Keates on his Honda CRF day., he took the win with a 35.34 with Richard Bowker on his Honda CFR second on 36.40s and Simon Hocking on the KTM, third on 38.80s. 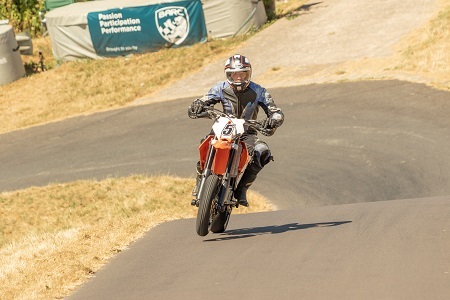 Guy Ursell on his KTM took command of this class from the outset. 33.63s run was not only a great time but Fastest Bike Time of the Day! Great riding! 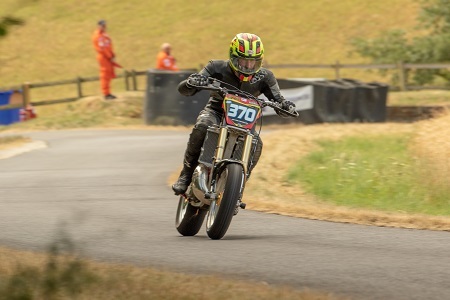 Allan Jolly and the Aprilia TZV took the class win on 33.78s. 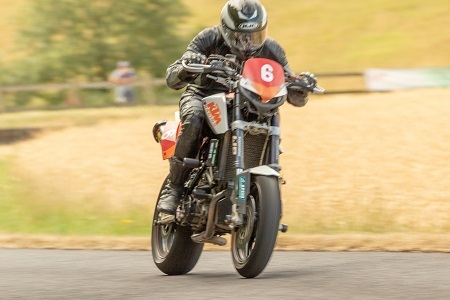 Second in class was Simon Gates on his Kawasaki ZR10R, a first time rider at Gurston and on a hill climb too. He finished on 35.75s and said after his first day “most fun I’ve had in leathers for a long time”. Simon wasn’t entered for Sunday but was back in the morning for another go! It’s a while since we have had a trike at Gurston Down. 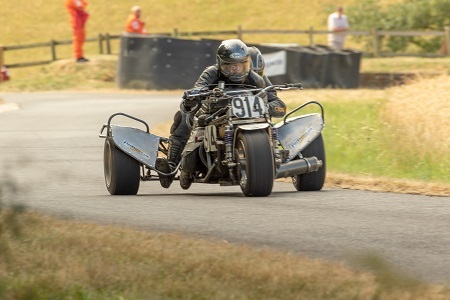 We have just one entry, Jon and Isaac Warren go on their Suzuki 1000cc trike, they finished with a 36.83s. Then came the Top Ten Run-Off. 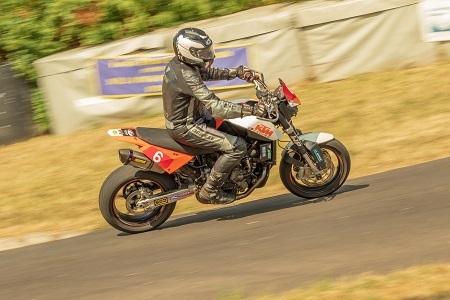 The Ten fastest motorbikes and combinations will competed again. Guy Ursell had been in top form all day and the Run-Off was no exception. His time was just a whisker slower than his class time, finishing on 33.68s, Alan Jolly second on 34.07s, Chris Keates third 35.25s and Simon Gates fourth 35.29. Tristan Anderson with his KTM had the class to himself and finished on 37.82s. 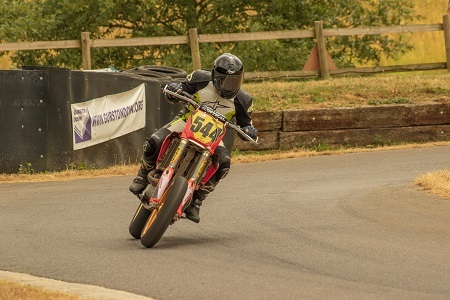 Mike Tilley on his Honda CR had another great class win, improving on Saturday’s time stopping the clocks at 35.60s. 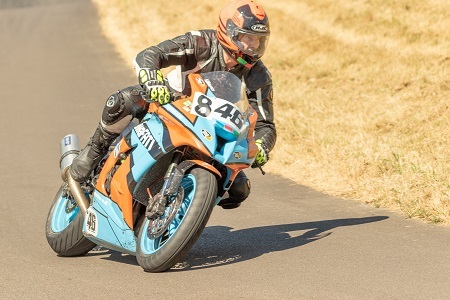 Guy Ursell on his KTM took command of this class on Sunday too. He had an improvement over his Saturday time finishing on 33.51s. Allan Jolly and the Aprilia TZV and Simon Gates on his Kawasaki ZR10R, had equal times of 34.32s, but Allan’s other timed run was faster so he took the class win. 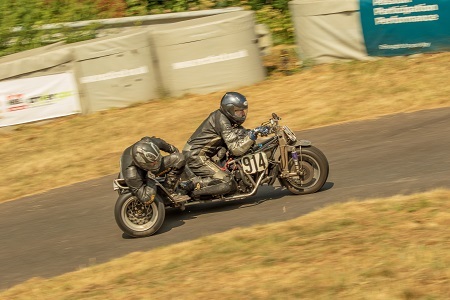 Jon and Isaac Warren took to the hill again on their Suzuki 1000cc trike. Their Sunday time was an improvement over Saturday’s, they finished with a 36.65s. 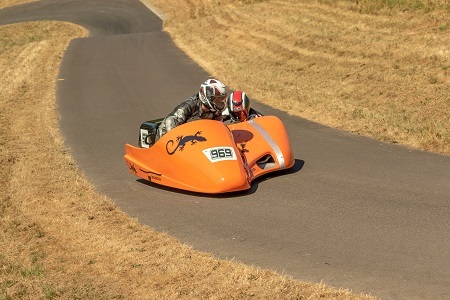 Simon and Jayne Foster on their Honda F2 were in charge from the outset on Sunday. They ended the day on 36.49s ahead of the Patrick and Paul Keates on 37.35s. This time it was Glyn Poole on his Honda who took the win and Fastest Time of the Day for bikes at 33.49s. 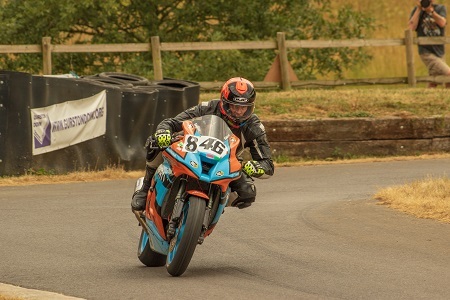 Guy Ursell on his KTM second, Alan Jolly on his KTM third and Simon Gates on his Kawasaki fourth. They finished on 33.70s, 34.17s and 34.36s respectively. 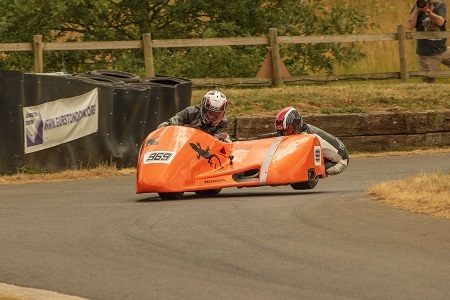 Simon Gates went through Hollow at 108.0 mph and over the finish at 103.7 mph! We would like to thank everyone who made the day possible, the office staff, the marshals, timekeepers, scrutineers and officials without whom we couldn’t run the meeting. Thanks to Ashley Wood Recovery, TSL Timing, Steve Lister, A-Cute Medical Services, Venture Security and Peter Crutcher from Ringwood PA.